Download video files, which are available online. Get video clips that are recorded using our friend’s gadgets. Obtain video clips from distant locations via email. Transfer videos from other systems, devices to ours etc. But, typically when any user tries to play external (received) video clips on their computer, they may face one or the other playback issues. Sometimes, these video files fail to play properly, at other times they never play at all. And, at this minute definitely, you will try to get another copy of the unplayable video, if possible (if it is downloaded from the internet or a friend sent you that video). If you cannot obtain the photocopy of the file, then you will try to repair the video file. But, it is not always the corruption, which makes your video file unplayable or results in playback issues. Even codec problem can cause general issues in playing your videos. and, for fixing videos tools you choose must be compatible with codec of the video. For fixing MPEG4 video files you need tool that supports this codec. Likewise, for other codecs too. Hence, it is important to know the codec of video file. A codec is a computer software, which encodes and decodes a video or audio file. Every single audio, as well as a video file, is made up of a codec since it keeps your video/audio file tiny and makes playback easy. And, codec usually functions with your system media player as a part of it. Codec installed on your system decodes your videos, music files, which are encoded with a specific codec and allows the media player to play them. If you are experiencing any issue while playing your videos, then you can have a guess that one of your codecs used to play the video might have got corrupted. If not, it might be that you don’t have the right codec on your computer to play the video appropriately. Many media player including VLC has their own set of built-in codecs. But, if you are employing any other player then how to find the codec of a video that you are playing? Well, here is the way to do it. 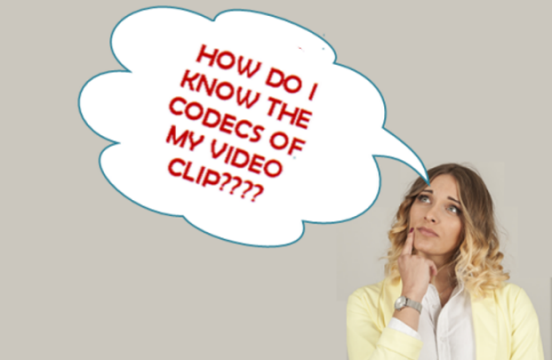 How to find the codec of a video file using the manual method? You can easily get video codec information on your Windows and Mac computers using your own operating system functionalities. Just follow these step by step guidance to do so. Note down the codecs that are used to create the video file. Now, you can download the required (noted) codecs from their official websites. Once you completed the download process, install them and open the video file using your regular media player. If you cannot find out the codec information of your video file or if you feel difficulty in checking it manually or the video clip is still not playing even after you have installed the codec, then you can make use of various available tools like MediaInfo, VideoInspector, Codec Installer, GSpot, AVIcodec etc. to get adequate codec and play your video. How to convert videos to different formats?